Blue and white Willow pattern china with cup inserts. Mosaic hearts reading to hang. 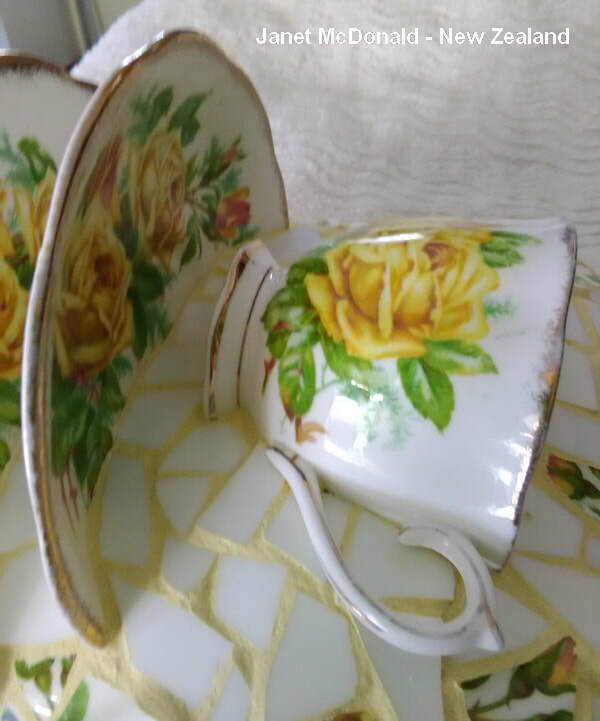 A small plant can be placed in the cups. 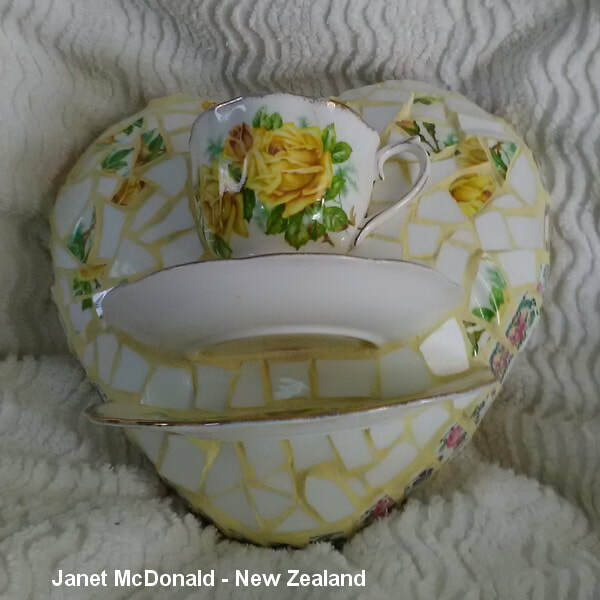 Large heart is 23cm tall. Smaller heart is 16cm (without beads measurement). 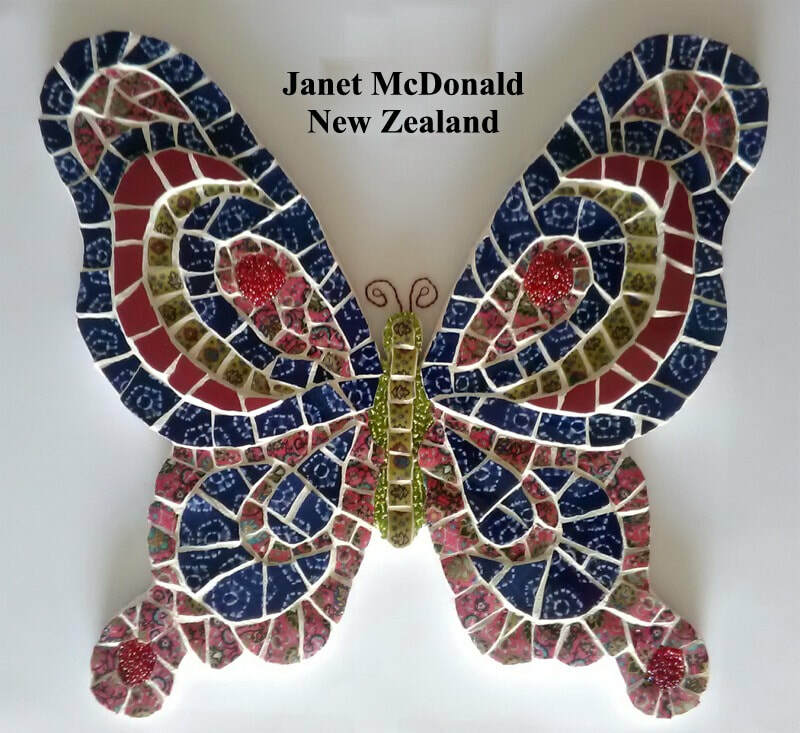 This butterfly is made from dinner plates, coffee mugs,ceramic tiles and glass beads. 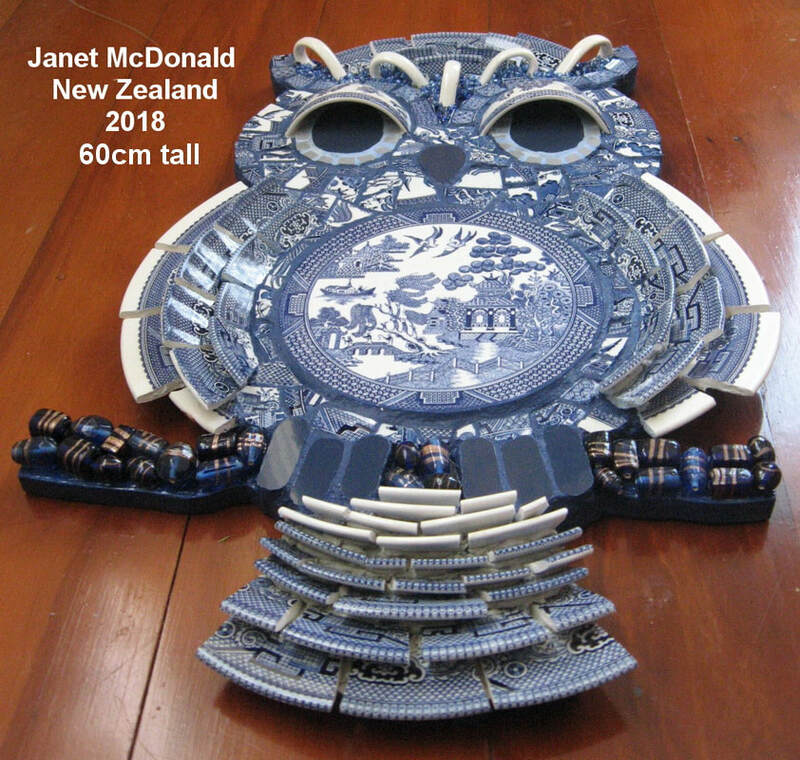 It is 36cm high. 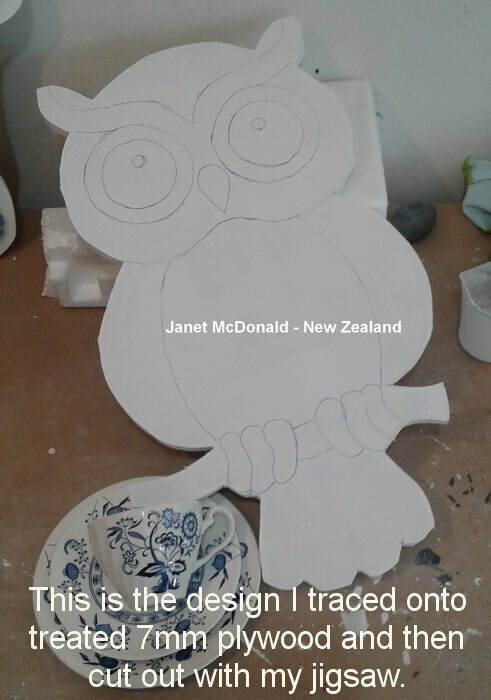 Olly Owl I created in 2018. 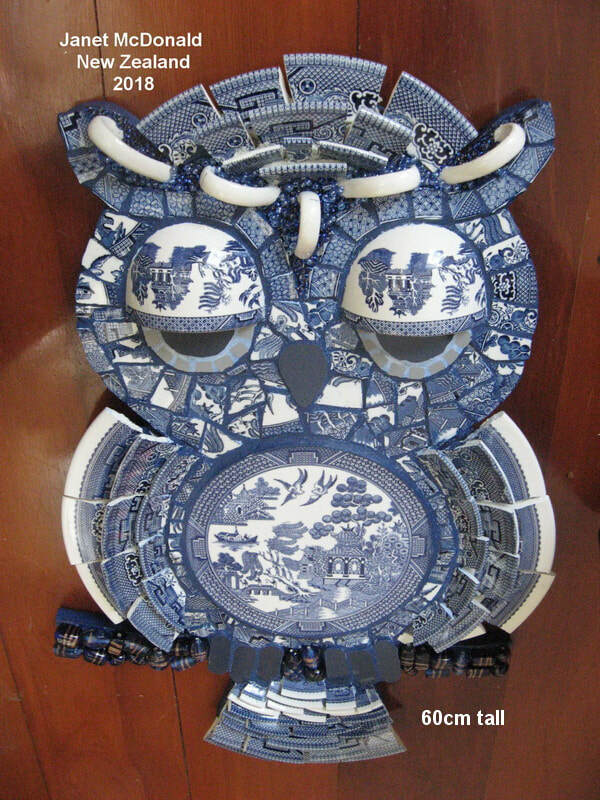 Olly was made from a blue and white, Willow pattern crockery. 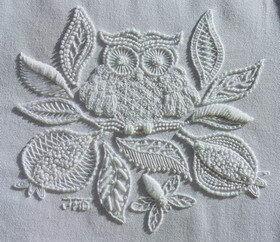 See below the Jacobean Owl below for more information. 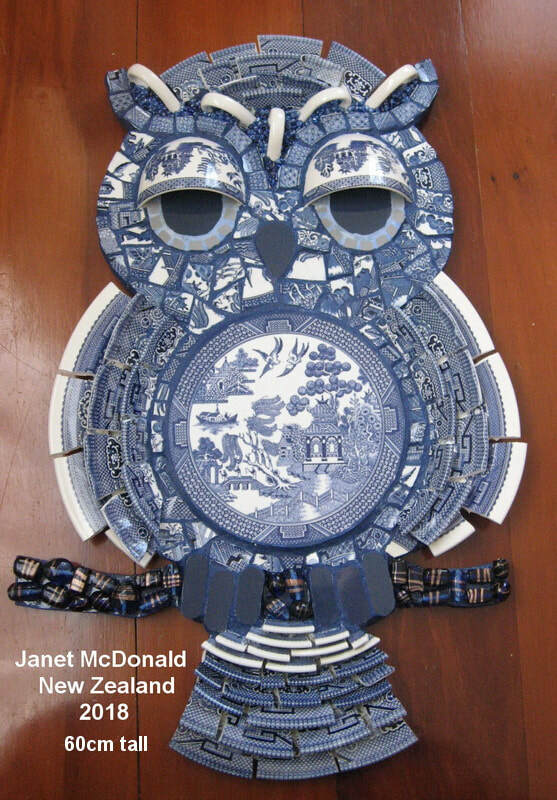 I choose this tea set to make the Owl from as I loved the Jacobean 'tree of life' depicted in the tea set design. 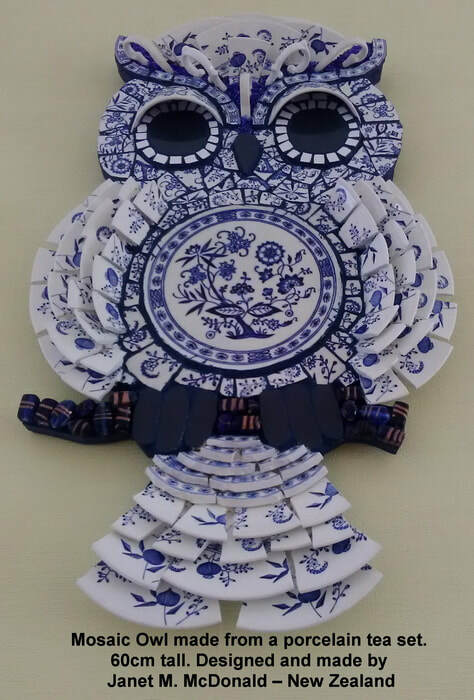 Blue Mosaic Owl made from a porcelain tea set. 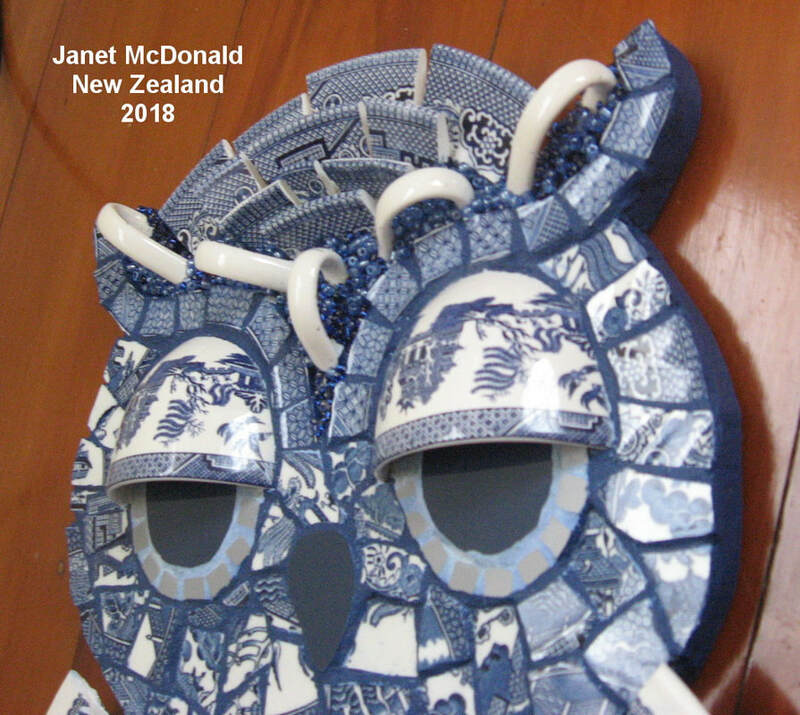 The inner eyes, nose and feet have been cut from porcelain tiles. 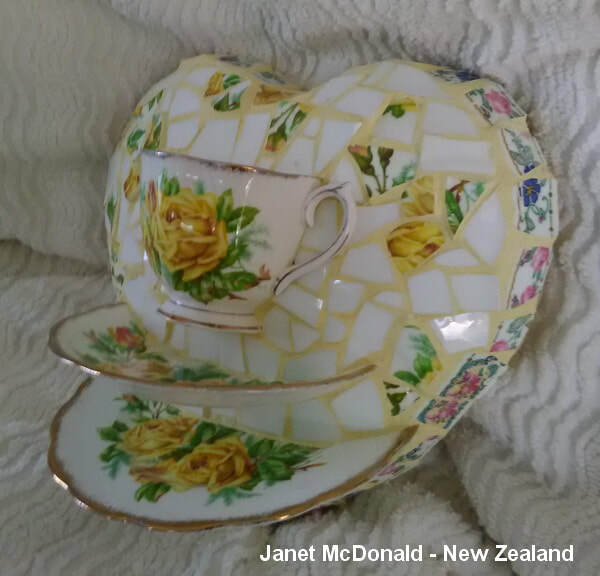 Small beads are attached under the head cup handles. On the branch large blue/gold beads are attached. All have been adhered to a wooden back. He is 60cm tall and 34cm wide. 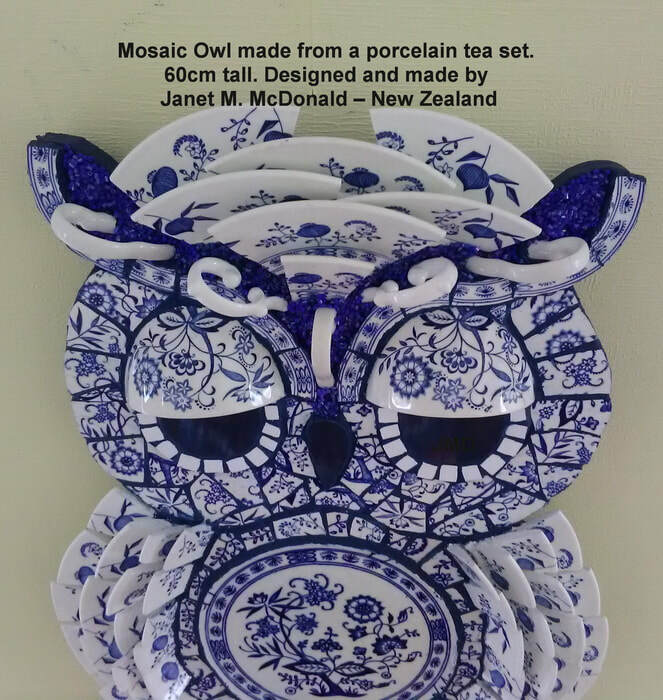 All porcelain was hand cut with a dremel tool. 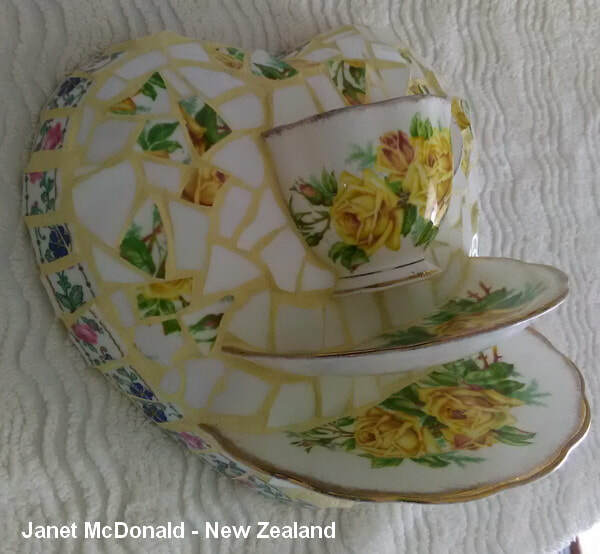 The heart is covered with a fine china tea set. 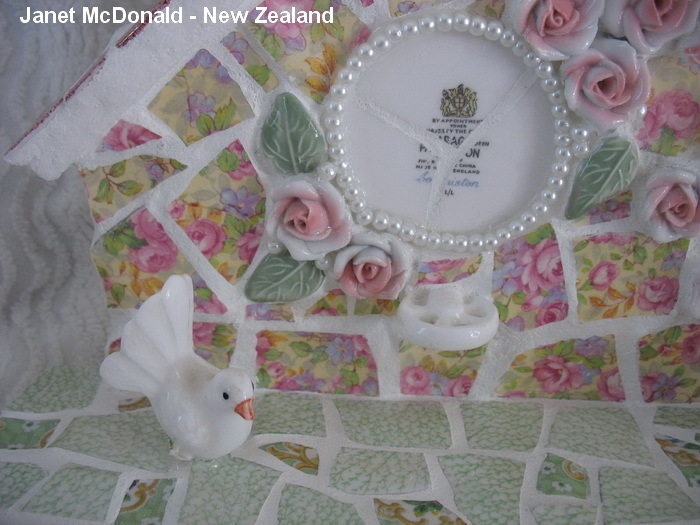 The heart is made of polystyrene and then was covered with mesh and thinset. 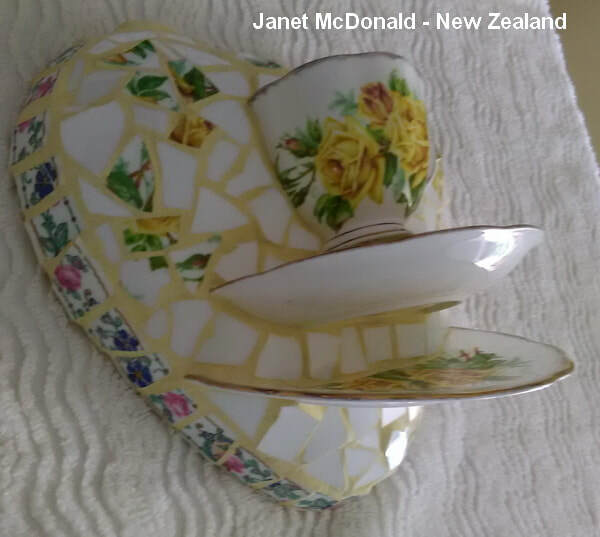 The china cup and plates were hand cut with a dremel tool. 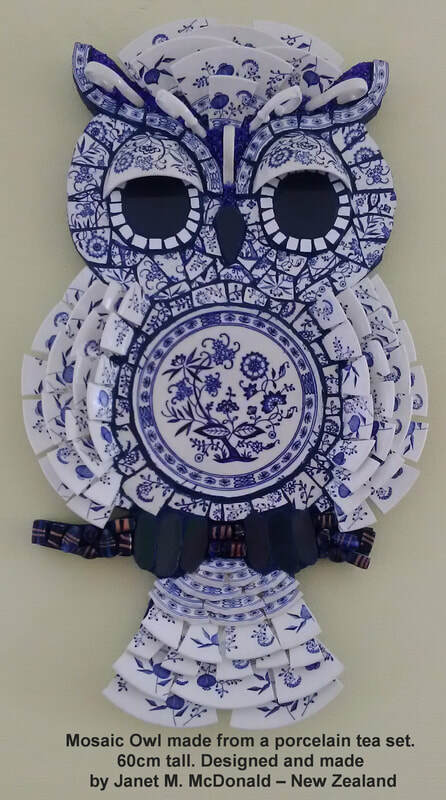 This mosaic birdhouse I made from broken bone china plates. 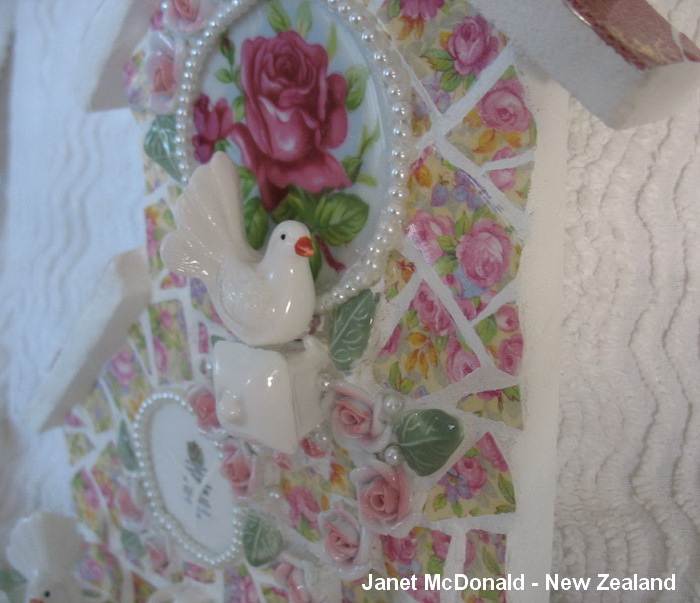 The roses, doves and perches were taken from other china ornaments. The pearls are made of glass. It is all adhered onto a wooden structure I made. 30cm high. A little too cute for my home, but I do enjoy the "Shabby Chic" look. 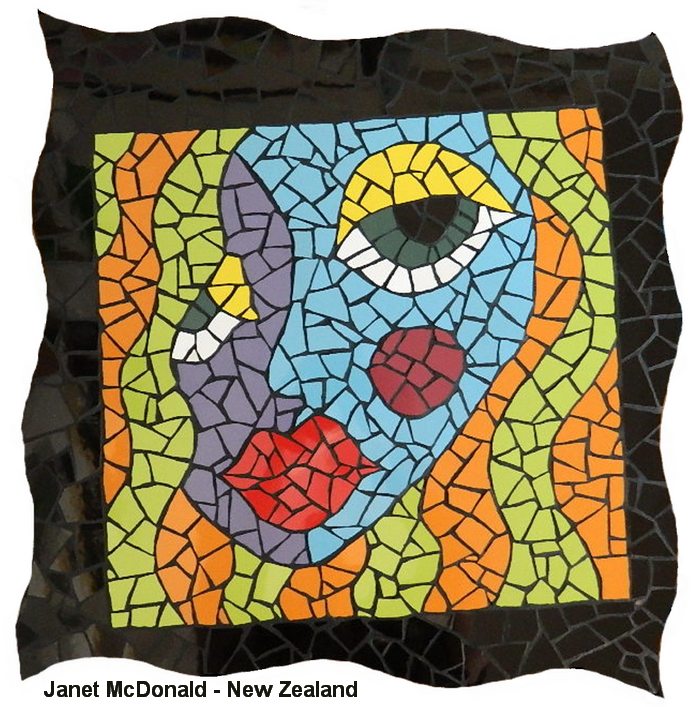 An abstract Mosaic face. It is 52cm in size. 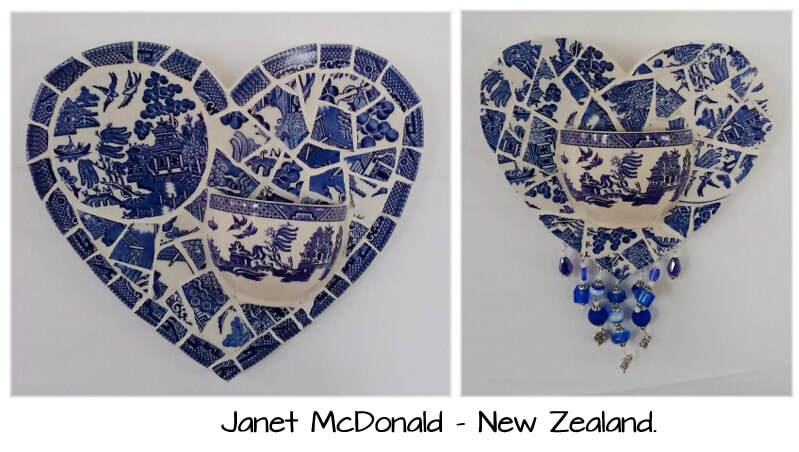 I hand cut porcelain tiles. I cut the whole shape out of treated plywood timber. 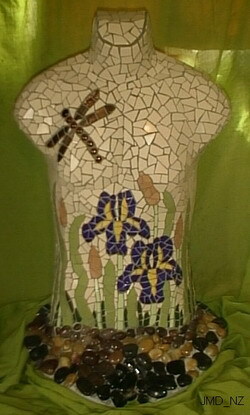 Mosaic Torso "Lola": This whole mosaic torso I made from scratch. The concrete torso and plinth I sculpted. The torso is 1 mtr (3 feet) tall and set in a mortar plinth. I adhered the ceramic tiles I hand cut into shapes. Mortar was used for grouting. This Betty Boop wall hanging is 28 x 34 cms (11 x 14 inches). Made of ceramic tiles I hand cut and gold shimmer glass was used for her earrings. The wooden shape I cut out with my jig-saw. 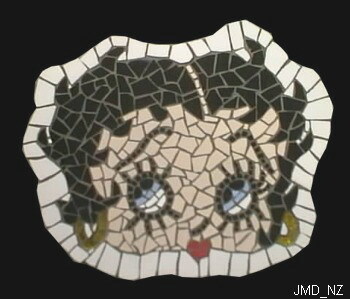 I made this as a gift for a friend who is a Betty Boop fan. 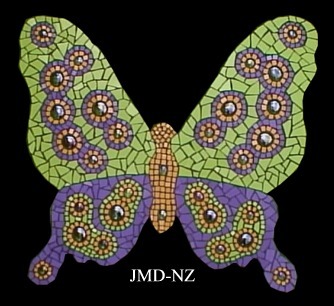 This butterfly is 53 x 55 cms (21 x 22 inches). 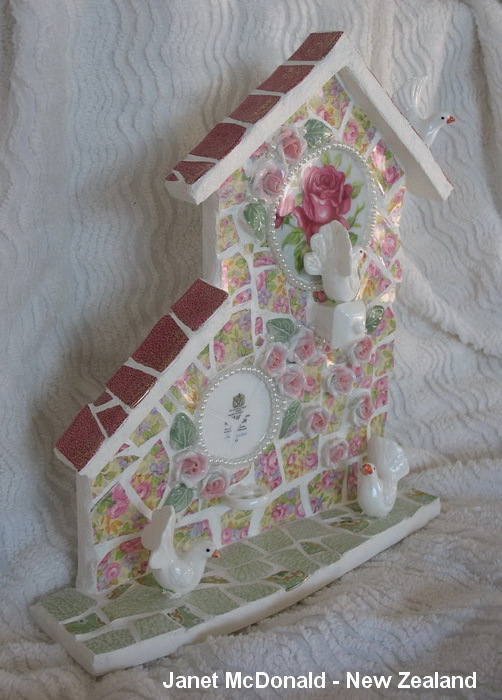 Made of tiles I hand cut and then adhered onto wood, that was cut out with my jig-saw. 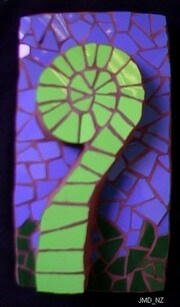 Bright green, purple and yellow ceramic tiles and green glass pebbles were used. 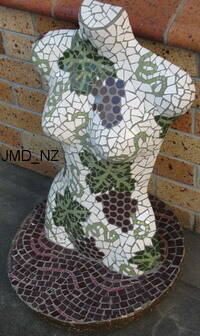 This whole mosaic torso/plinth I made from scratch. The torso is 1 metre (3 feet) tall and set in a concrete plinth. I adhered the ceramic tiles with Adhesive Concrete (thinset) that I had hand cut into shapes. Mortar was used to grout all parts of the torso. With thin sheets of copper were cut into squares and applied in a shingle effect around the base. The body depicts a woman stomping grapes. This terracotta pot is 26cm (10 inches) tall. The ceramic tiles I cut too shape. The top of the pot and inside are painted. Mortar was used for grouting. 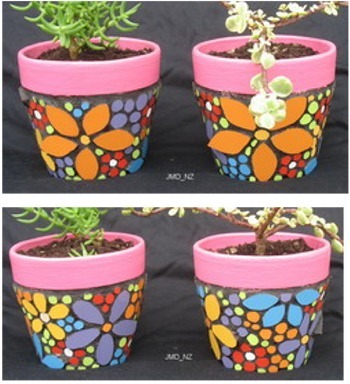 These are two terracotta pots above showing the front and backs. They are approximately 12cm (5") tall. The ceramic tiles I cut too shape. The top of the pots and insides are painted. Mortar I tinted black and used for grouting. This fish is in memory of the ones that got away. 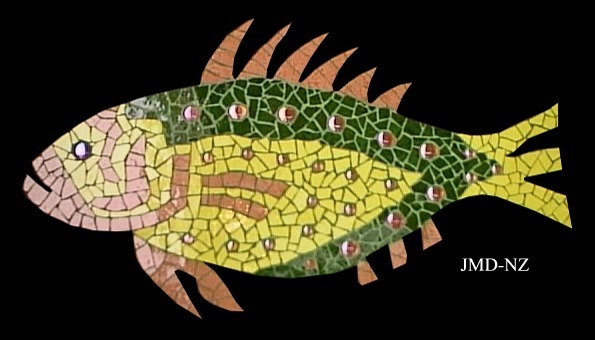 The fish is 92cm (36 inches) long and 50cm (20 inches) wide. 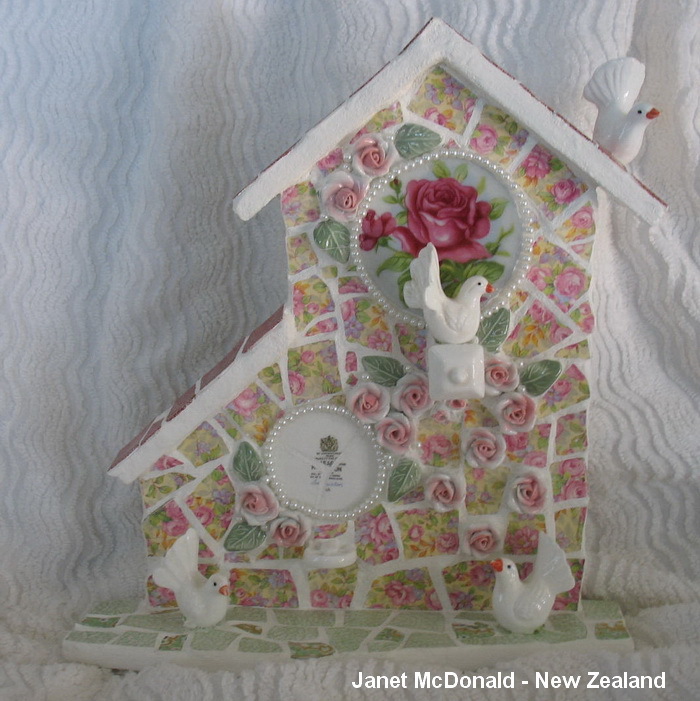 He is made of tiles I hand cut and then adhered onto wood, that was cut out with my jig-saw. 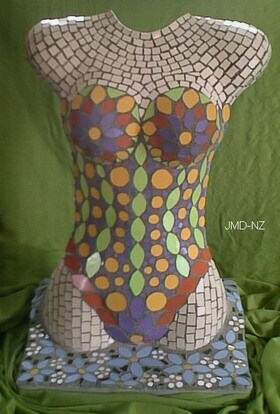 I used 3 shades of tile for the body and glass pebbles around the body. 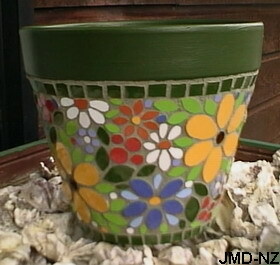 Green grout was used on top and smoothed around the edges. 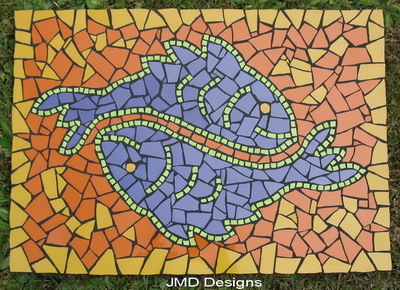 The inspiration for the fish came from a line drawing I found in a book. Suitable for hanging indoors or semi-sheltered outdoors. There is approximately 30 hours work in this fish. This whole concrete mosaic torso I made from scratch. The torso is 1 metre (3 feet) tall. 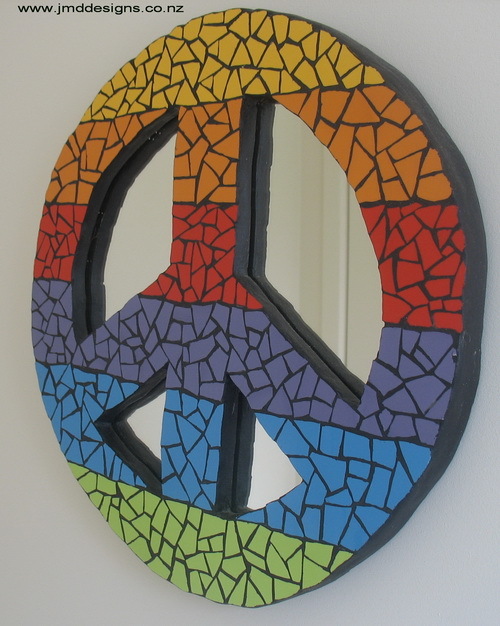 I adhered the ceramic tiles I hand cut into shapes. Mortar was used for grouting. He has real pebbles at the lower front on his body and a tiled pond with a fish at the back area. So to give the look of him up to his waist in water at the edge of a pond. i.e. Skinny Dipping.. 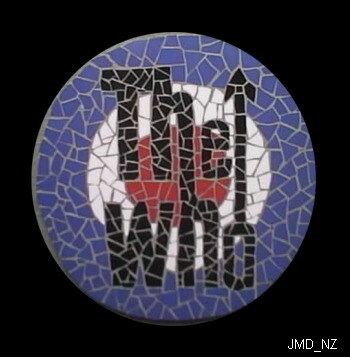 This logo was/is used by the music band "The Who". The background is English colours as they were/are an English band. The layout of the writing was a kind of trademark way they wrote it. If you don't know who The Who is then ask your parents. *wink*. 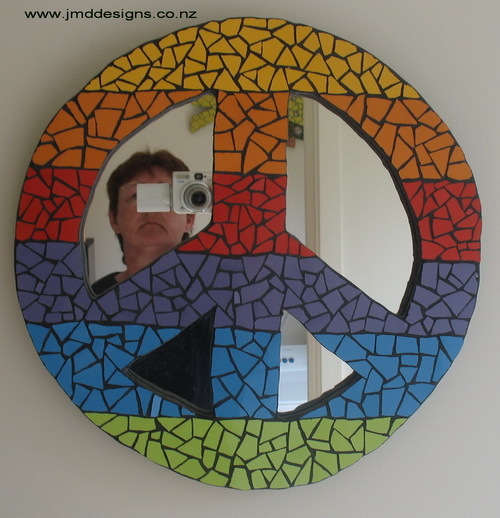 The whole piece is 40cm (16 inches) round. 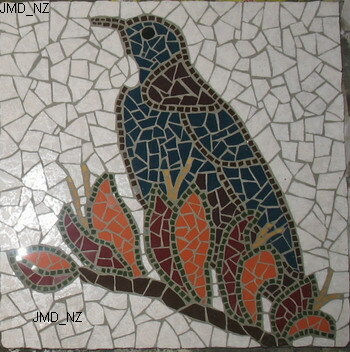 Made of ceramic tiles I hand cut. The wooden shape I cut out with my jig-saw. I made this as a gift for a "The Who" fan. 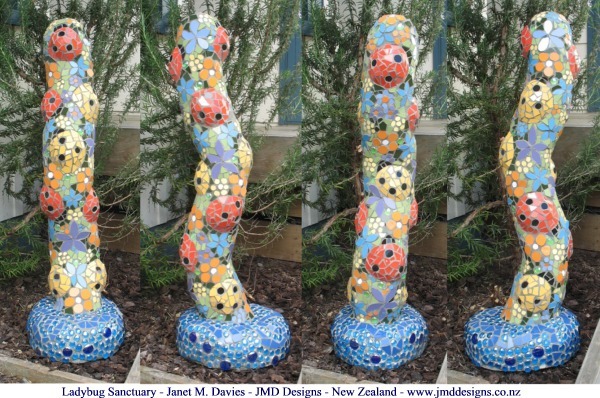 This 'Koru' sculpture is inspired from the native New Zealand fern frond. 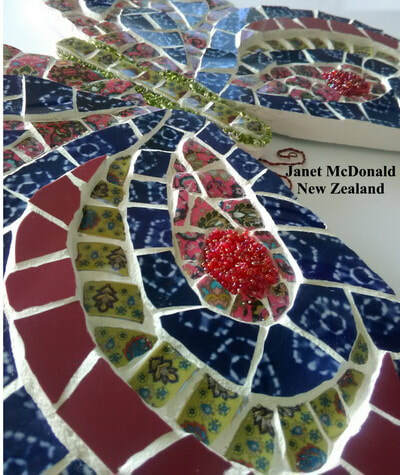 In the Maori culture the Koru stands for new beginnings, life, harmony and growth. 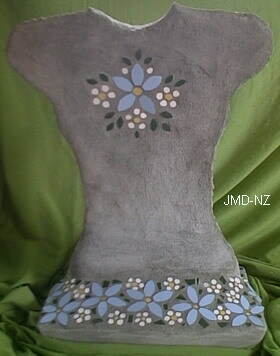 I hand carved from a block of mortar to make the koru stand proud. The rustic red grouting is the finishing touch The whole piece is 22 x 11cm (9 x 4 inches) with each layer being 3cm (1 1/4 inches) thick. This pink edged pot is approximately 15cm (6") tall. The ceramic tiles I cut too shape. 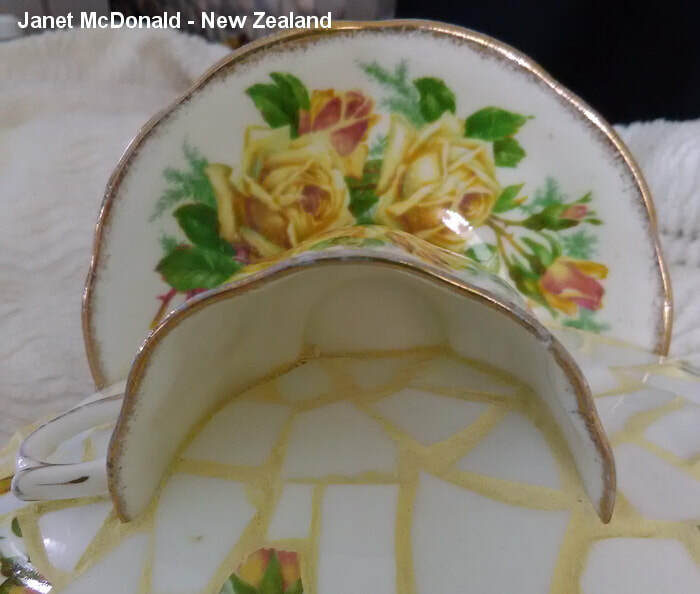 The top of the pot and inside is painted. Mortar was used for grouting. 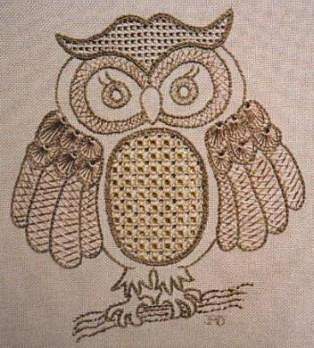 The mosaic owl design above is based on some owls I designed for my Mountmellick (Irish) and Schwalm (German) hand embroidery books. 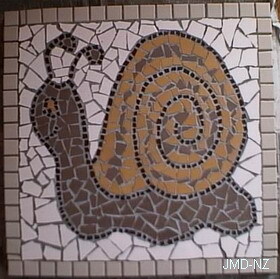 This snail is on a ready made concrete paver.The snail design matches the owl paver design. The paver is 45cm (18 inches) square. 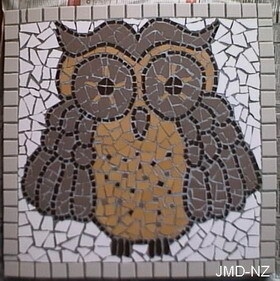 He is made of ceramic tiles I hand cut and then adhered to the paver. Mortar was used for grouting.